On Wednesday, March 13, 2019, around 6:30 PM, members of the Pomona Police Department's Major Crimes Task Force (MCTF) were working a gang suppression detail within the City of Pomona. Through gathered intelligence and armed with a search warrant, Officers responded to the Suspect’s residence and served a search warrant in the 600 Block of E. Mission Blvd. During a search of the residence, Officers located a large amount of meth and heroin packaged for sales. 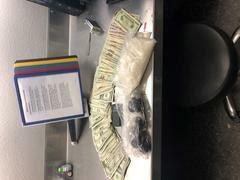 The total amount of narcotics seized had a street value of $9,000. The City of Pomona is dedicated to addressing quality of life issues and often uses partnered Law Enforcement agencies to accomplish one common goal of ensuring the safety of our community.